So I think this is the last set I have to post for awhile and I believe it is my favorite! I don't know if it is the colors or the flowers, but either way I really love this one! The sentiment is from Sweet Treats as are the flowers. 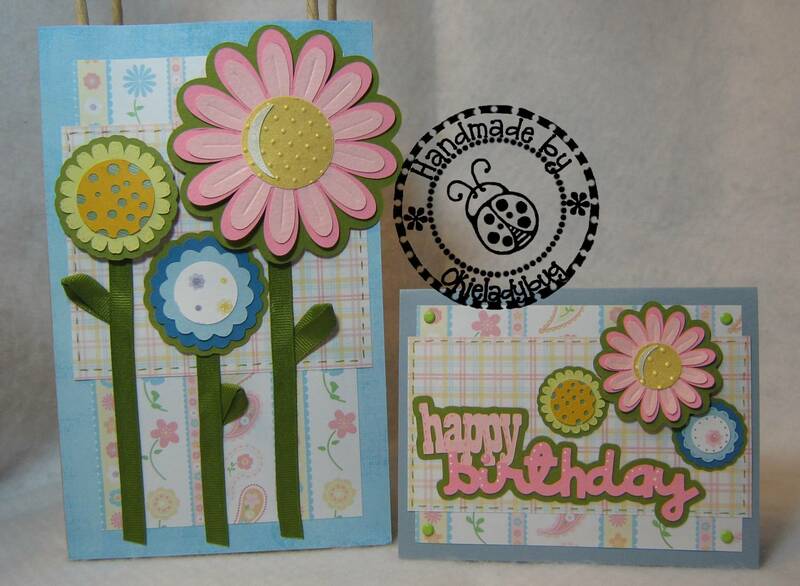 I layered the sentiment using the same colors as that were used in the large daisy looking flower. I can't remember what size I cut all the images because I used Design Studio and I rarely pay attention to the sizes. 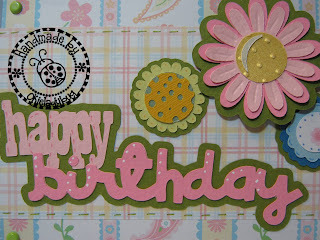 I am wondering how easy the new Cricut Craftroom software will be to use and can't wait to find out! I am sure there will be some things I don't like about it but as long as I can see the screen I should be in good shape *okie cusses under her breath about the Gypsy*. I like how the large flower goes off the front of the gift bag. I keep wanting to do more of this method because I think it looks cool but I usually forget while I am designing and then don't want to go back and redo a design...YES IT IS BECAUSE I AM LAZY! *okie rolls her eyes and hates her readers making her be honest*. I used the Swiss Dots folder on the large flower center to give it a little dimension. A stylus was used on the petals and you might remember this method from a post a few days ago on the Half Flower set that I did. I made the leaves on the stems by looping grosgrain ribbon and then attaching to the back of the "stem" with some ATG tape. Now what to post tomorrow....hhmm, choices, choices, what shall I choose?? Oh I love this! Makes me think of spring! 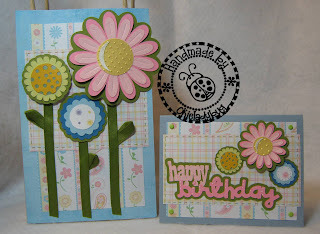 I love all your card sets, this one is so adorable and I love how you used ribbon for the leaves. Tomorrow you could post pics of you opening the large box 'o goodies from consumer crafts! We should have a party!!!! This is such a gorgeous set! I have loved all your gift bag/card sets, but this one is especially nice. Love your flowers. Another great project, tfs. Now I want that cartridge too! Super cute! I love the gift bag and card! Great idea as always! This looks so "summery"! I can hardly wait for my Sweet Treats cartridge to arrive so I can play with these flowers! I love the ribbon stems and leaves. They and the use of the stylus add so much dimension. I am ready for flowery spring things. Here in West Tennessee we got a couple of inches of snow yesterday and are expecting more tomorrow. So cheerful and happy looking! I think this is my favorite too! very cute card!! Love the flowers!!! 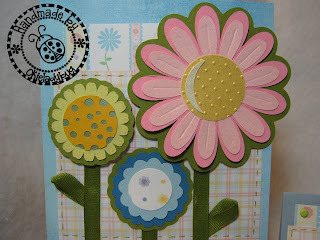 I just love this card and it reminds me of spring. I love the colors and your doodling on the "happy birthday"!